Listening to this TED lecture by cyborg anthropologist, Amber Case about the compression of time and space, ambient intimacy and simultaneous time interfaces got me thinking about how our teaching methods will have to evolve in the next decades if we are to keep up with the 21st century students. It’s hard to imagine that the traditional private piano lesson where students progress through method books, slowly but solidly building up their knowledge of music theory, technique and repertoire may someday be obsolete. But it’s starting to seem more and more obvious that the teacher who doesn’t at least acknowledge the changes in his or her students learning styles, may find their rosters shrinking. I have a mixed studio. Some students are not allowed to surf the web. They do not have cell phones or video games and they are not allowed to watch excessive TV. Their parents stress academics, reading, and hands on activities. They take things slowly, building up their knowledge one step at a time. Others, mostly teens (and interestingly mostly girls), are fully immersed in technology. The silenced cell phone is the last thing to leave their hands before they start their lesson and the first thing they pick up after they finish playing. I have to admit that I find these students fascinating! On several occasions students have been so motivated to learn that I’m able to explain a concept, such as major and minor scale patterns, and they are able to construct all 12 major and minor scales and triads by the end of the first lesson. They come to their lessons with a list of composers and pieces they’d like to learn. Some have already started teaching themselves and want to make sure they are on the right track. These teens come to their lessons ready to get down to work, not to be spoon-fed information. Elissa Milne, creator of the P Plate Piano series, talks about teaching the new generation of children and the “deeper-sideways kind of learning” that’s going on. I think she hits the nail on the head here. These iPad children interact to learn. They are not waiting to be passively filled with information (as if children ever were), but are actively engaged in constructing their own learning experiences through this technology that does not rely on advanced literacy in the user for functionality. Instead of exploring broadly, children can explore deeply, changing direction and focus as it suits them, not as suits their parents or older siblings. They are simultaneously more prepared to spend time engaging with learning and more prepared to move on to a new challenge if the present activity fails to exhilarate. This changes the way we can teach, and it must change the way we do teach. One of the most exciting aspects of P Plate Piano is the range of activities designed for this 21st century style of learning: experimentation, exploration, reconfiguration, extension. This deeper-sideways kind of learning looks like ‘mucking around’ to the traditional teacher or the exam-obsessed parent. But this kind of learning is the kind that creates musicians out of piano students, and unless you become a musician your piano lessons (and your examination certificates) won’t be worth much in the long run. 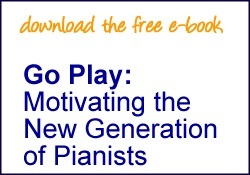 So, if you’re a piano teacher and you’re reading this you’ve already got a foot in the door. You know how to surf the internet and find music blogs. Twitter and Facebook are your next step. But I’m afraid to say, if you’re refusing to use a computer, email, or a cell phone, you might find yourself at a loss when today’s newborn comes knocking at your door for piano lessons in 14 years. I was listening to my local public radio station in the car this morning. They’ve lost all of their state funding and now are forced to depend on the community for support so they are in the midst of another membership pledge drive. In return for the pledges they’re giving away tickets to see Garrison Keillor, a dozen long-stemmed roses, hats, mugs and CDs. One of the CD’s is a compilation called “The Most Relaxing Classical Music in the Universe!” Apparently according to a poll of the station listeners, most of them enjoy classical music because it’s relaxing and it helps them unwind. Gosh! I know that in the world of fundraising, you have to appeal to your donors, but wouldn’t it be great at least try to get some new young listeners? I understand that the younger audience may not have the disposable income to be supporting public radio while paying off student loans, but to spend ten minutes talking about how relaxing and calming classical music is only going to alienate them. Most people, myself included, are not in a position to chuck it all in, put up their feet and snooze away their day. They say for every $40 individual membership, the station will be able to purchase 8 new CDs. Will this include yet another version of Pachelbel’s Canon, Clair de Lune, or the Moonlight Sonata? Here’s an idea! Let’s let the donors choose the titles of at least 4 of the 8 new CDs the station will purchase. Or how about inviting some local college music students into the studio to talk about programming. Devote one hour a week to a discussion of the more experimental side of classical music including recordings of local performances. No state funding? Why not use this as an excuse to get wildly creative? Save the relaxing music for the dogs. Just came across this wonderful new video from Anderson & Roe. The music from Carmen has been a favorite of mine since I was very young, reminding me about how important it is for young students to listen, listen, listen! Are you listening, students? Every week I’m surprised at how many of my piano students do not listen to music. Not just classical music, but it seems any type of music (except for top 40 pop music.) Many have never even listened to the Beatles – or Led Zeppelin! Anyway this is what they tell me…. So this week I’m issuing a Listening Challenge. I’m asking all of my students to listen to 100 pieces – orchestral, piano, opera, jazz, classical, classic rock, anything…as long as it’s not something they hear every day. They can use YouTube, CDs from the library, their parents’ collection or their own. I just want to get them listening. I’ve also asked them to keep a listening journal listing each piece along with the composer, performer, a brief description and to give it a thumbs up or a thumbs down. If they attend a live performance, they can get credit for five pieces. Understandably, when I explained the challenge I didn’t get a very enthusiastic response from my students – that is until I mentioned that the first three students who complete the challenge will receive an iTunes gift card. Considering that I’ve been under the impression that they don’t listen to much music, I did get a lot of smiles when I mentioned the “prize.” Makes me wonder what they would choose to buy. Hmmm. For the early grades, Vandall and Alexander have great pieces that sound big, but aren’t too difficult. Students should know the piece inside out. Memory should not be an issue. Pieces should be memorized months before the competition. Give the students as many opportunities to perform for each other as you can in the weeks leading up to the competition. Pieces peak and then get stale. Time it right and they will peak on the day of the audition. Have your students bring the shoes they are planning to wear into their lesson so they can try the pedal and you can check them out. Remember the judge is human and might have a headache. Who knows, they might not like the music of Vandall or Alexander. A positive attitude from the teacher can make all the difference when the competition results are announced. And, now that most of my work is done…and I wait for the students to go in front of the judge, maybe I’ll microwave some popcorn and watch a movie. Turns out that most students practice the music they like and, the more they practice, the more their overall piano playing improves. Just like in any other type of music, popular music has many rhythmic and technical issues for students to work on. As a teacher, I look forward to my students coming into their lessons with in an engaging performance of a song by Lady Gaga or Coldplay, as opposed to yet another unenthusiastic (sometimes pedantic) performance of a Clementi Sonatina. I have no doubt that the same students that learn to play the piano by playing the music they enjoy, will not hesitate to open up a book of Bach Preludes and Fugues when they “discover” Bach or a book of Mozart Trios, when they decide to get together with some string students. And finally, I can be certain that the students who are enthusiastic about playing popular music truly love playing the piano. They are not being pressured by their parents or by unrealistic goals and they have no plans to major in music in college. But, unlike some of these other students, I can be sure they will be playing piano for the rest of their lives. I can still remember my favorite pieces from that stretch from 6th grade to 9th grade – the theme from “Born Free,” the “Maple Leaf Rag”, and “King of the Road.” The one piece I did NOT like during those early years was the 1st movement of the Moonlight Sonata. In fact, that piece almost drove me away from piano all together. So anyway, what do I have out on my piano right now in preparation for a 2011 Salon Concert? The Moonlight Sonata, of course, and I’m loving it. Thanks to classical crossover groups like the Australian group, Aston, young students see that just because they’re taking piano lessons (or violin or cello), it doesn’t necessarily mean they have to work for hours and hours on music that doesn’t speak to them. By working on the music they love, they are putting in their 10,000 hours and working on the same musical and pianistic skills they will need regardless of what type of music they end up playing. 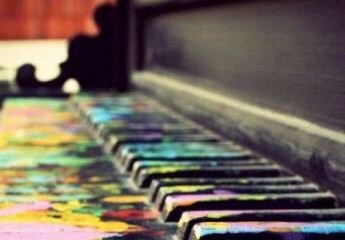 I was always befuddled when a piano teacher would tell me to “say something” with a piece of music. Of course, intellectually, I knew that it meant that I was supposed to be more expressive, shape the phrases, sing out the melody, keep the accompaniment softer, etc. But no matter how much I tried to play musically, I was never quite sure if I was saying what I was supposed to say, if I was saying anything at all, or if in fact I had anything to say! I try not to be so vague with my young students and sometimes we come up with quite silly sentences to go along with the music. This helps with everything from tricky rhythms (think Mississippi Hot Dog) to sentences that go along with unusual phrasing, and very often, story lines to convey emotion similar to Bernstein’s Beethoven example above. Two days ago I found a surprise gift in my mailbox at The Music Studio – The Unanswered Question: Six Talks at Harvard by Leonard Bernstein. What a treat! Agree with him or not, it’s fun to see how Bernstein compares music to language where a note is a phoneme, a phrase – a word, a section – a clause and an entire movement – a sentence. I find this fascinating, not only because my old questions about how to “say something,” but because it brings back memories of my 9th grade English class and diagramming long and complex sentences. And, I loved those assignments!